Tragedy befalls a peaceful kingdom when a sacred jewel is lost. 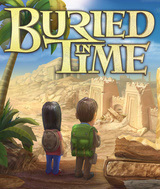 Hundreds of years later Bingham and Jack, two young archaeologists, arrive in search of the precious stone and the secrets behind a city´s great demise. Help them reveal ancient artifacts and relics exposing a passionate story of love and betrayal. Do events in the past sometimes foretell the present? Could true love await you amid the sifted sands? Discover the truth behind a legend Buried in Time. Uncover the Valley of the Ancients in your quest for a lost treasure. Manage an archaeological dig as you build a team and keep them motivated by earning grants, collecting rare flowers, upgrading your camp, and cultivating relationships. But beware of those who appear dishonest. For only the pure of heart will prevail. Comments: I really love this game! Ifyou have played Artist Colony then you will understand how to play this game. I recommend it to everyone.